The Burmese civil war, often viewed as a genocide, committed against Burmaâ€™s tribal minorities, has been raging off-and-on for a period of nearly fifty years. Estimates claim that as many as two million refugees, many of the tribal peoples, have fled over the border into neighboring Thailand. 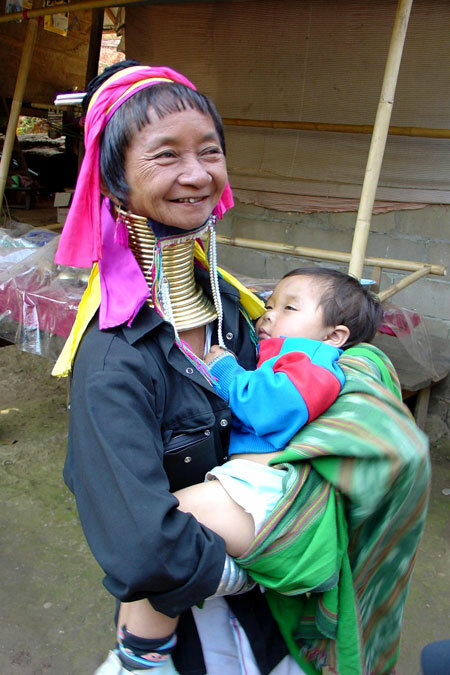 The Long Neck Karen tribe, so called because their women wear multiple neck rings, which elongate the neck, to several times normal size, have found refuge in artificial, tourist villages, where visitors, both Thai and foreign, pay a heavy entrance fee to gawk at the unusual looking people. 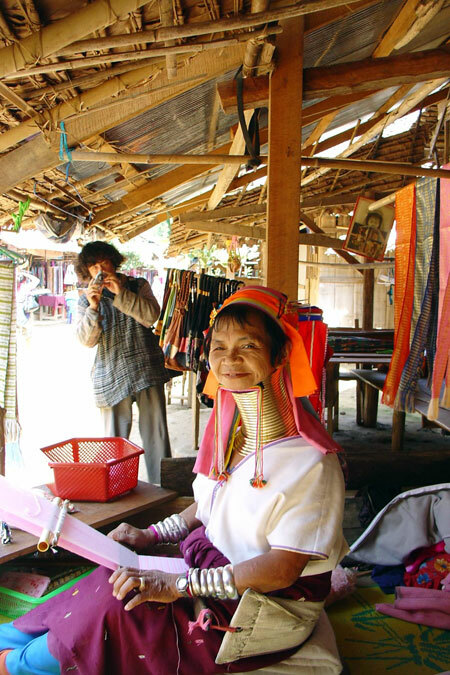 One such tourism village is Hoy Sua Toa Long Neck Karin village, located in Thailandâ€™s Mae Hong Song Province, within sight of the Burmese border. After paying their entry, tourists will find that the entire village is one huge shop, with women and children selling goods and posing for photos. There are no Karen men to be seen. Traditionally, tribal people lack a merchant class, and yet the village is 100% dedicated to the sale of trinkets. Karen in Burma live by planting and cultivating rice, raising animals, and by hunting. In Hoy Sua Tao, however, there are no rice fields. Ajan Prasit Leeprechaa, a lecturer at Chiang Mai University is himself a member of the Hmong tribe, a group persecuted in Lao, for fighting along side the Americans in the Indochina conflict. While countless Hmong families languish in refugee camps, awaiting resettlement in the USA, Ajan Prasit uses his education to study and help Thailandâ€™s many tribal people. â€œSome Thai made a fake village in Chiang Rai and Chiang Mai, and stole some Karen from here to live there. They charged 1,000 Baht or more for the entrance fee. But, the Mae Hong Song government went down and took them back here already.” Said Som Sak Seta. A Long Neck Karin Karen girl, named Mali, told us she hadnâ€™t been given any type of ID card, although she had already lived in Thailand for more than twelve years. â€œNo, no we donâ€™t. None of us have an id card, none of us.” Said Mali. If you donâ€™t wear the rings, will they give you money? Thai spies, in yellow shirts, hung around, photographing my team and eves dropping on our conversations. Finally, to avoid putting ourselves or the Karen in jeopardy, we had Som Sak Seta take us to a â€œreal” village, called Baan Nai Soi, where it was much easier to do interviews. Som Sak Seta explained the soldiers were only there to guard the border, merely a few kilometers away. While the soldiers sat on a cooler, sipping a coke, an eighteen year old Karen girl, named Zember, told her story. Since removing the rings, she finds herself in a situation of double jeopardy. Now, not only does she still have the lowly status of being a stateless Karen refugee, living in a sideshow, but the Karen elders shun her as a traitor to the ring-wearing community. Zember said that she does make frequent trips down to the city during daylight. â€œThey are just telling what kind of bombs, and how bad it is for these people, so the tourists can know.” Explained Som Sak Seta. So, what if the Karen disappeared? Mae Hong Song province would just be short of income. Isnâ€™t that so? The rings around their neck are cultural shackles. The Long Neck Karin are faced with a fatal alternative. Is it better to return to Burma, and risk death, or better to remain as a stateless sideshow attraction in Thailand? 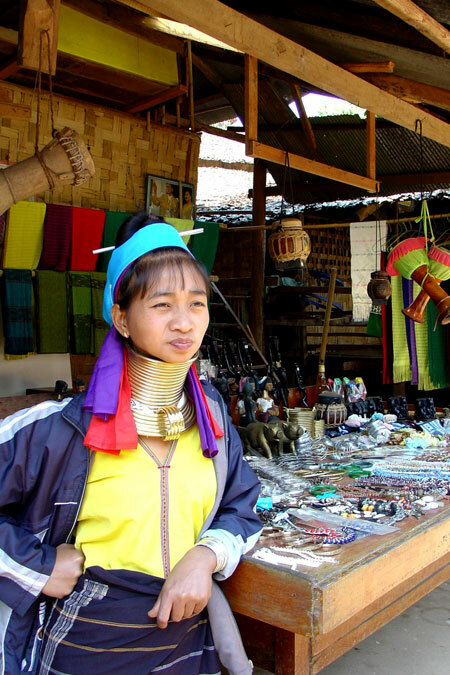 On the other hand, the Long Neck Karin, because of their unique appearance, are the only one of Burmaâ€™s many ethnic minorities who has this option of escape.